RAN/ DSTO/ ACS AMOG – Aadi Defence Pty Ltd. The need to constantly upgrade and add new equipment is simply part and parcel in keeping existing military platforms relevant in the modern battlefield. The Collins Class Submarine is no different in this respect. New additional equipment invariably increases the weight of the submarine. 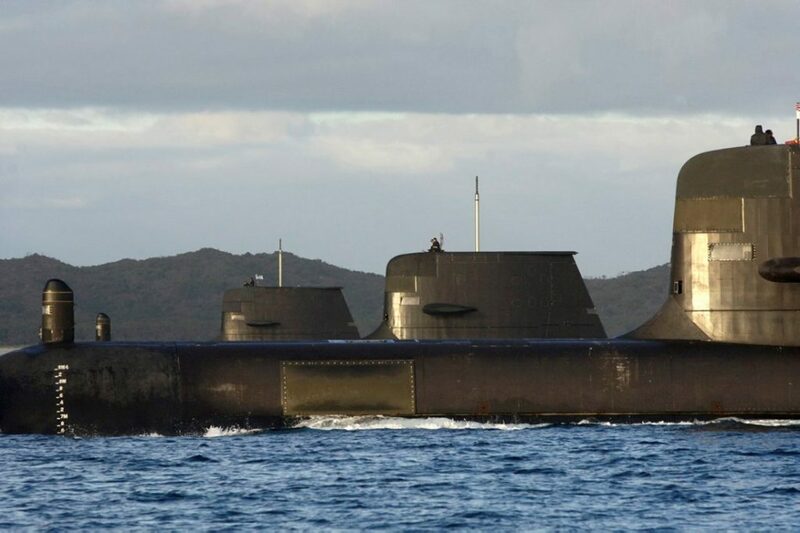 aadi Defence, in conjunction with AMOG Technologies and Advanced Composite Structures Australia are working with Defence Science and Technology Group (DSTG) and the Royal Australian Navy (RAN) in trimming some of the Collins Class Submarine’s weight gain via the use of advanced composite materials. Submarines are multipurpose vessels used for intelligence gathering, insertion of special forces, launching of underwater unmanned drones, to launching of sea to land missiles. With a single class of submarine, it was inevitable for additional equipment to be fitted onboard as the submarines are used in new mission roles. Additional equipment introduces additional weight to the vessels, and increased weight has detrimental impacts on a submarine’s sea handling performance. This project aims to reduce the weight of the Collins Class Submarine by replacing existing structures with advanced carbon fiber composite materials, and returning the submarine to near its original designed weight. Dr Schofield as a former board member of ASC and Chairman of the risk committee within ASC, is well versed in the problems the Collins Class Submarine has experienced in the past. As the Chairman for the ACS-CRC and board member of Advanced Composite Structure Australia, he is well versed in aerospace carbon fiber technologies and technical hurdles in developing new composite solutions. Dr Hinton is an eminent materials engineer who spent much of his career tackling maintenance issues associated with the RAN’s fleet of vessels. He is an instrumental member of the scientific team in developing sound testing and evaluation protocols and development strategy. Ross Milton was former Chief Engineer of ASC. As such, he is extremely familiar with the engineering of the Collins Class Submarine. His expertise in submarine engineering, in particular the Collins Class Submarine will be crucial, as the project involves major engineering work on the submarine’s structure. Maritime Division within DSTG is responsible providing the Royal Australian Navy with scientific and technical support. As such, DSTG’s technical evaluation on the feasibility of the proposed approach as well as ongoing scientific support was essential for this project. As the operators and owners of the Collins Class submarine, RAN is the end customer for this project. Working closely with RAN was crucial as the project can only succeed if it meets all of RAN’s needs and requirement. ACSA is the commercial off-shoot to the previous ACS-CRC. The team involved was responsible for the development of the composite wing for the Boeing Dreamliner, as well as composite bulkheads and structural components for Airbus and other major equipment manufacturers. Their unique skillset in carbon fiber composite is world leading, thus essential in this project. Having internally vetting the concept, aadi Defence worked with AMOG and ACSA who independently verified the feasibility of the approach to ensure that the base science and engineering are both sound and feasible. The weight of the Collins Class Submarine and the distribution of that weight changes its metacentric height. The stability of a submarine at sea is directly related to its metacentric height, and the at sea stability has significant impacts on a submarine’s ability to conduct certain missions. All this information is highly classified, and is information that aadi Defence is not privy to. Detailed analysis of the proposed concept could only be vetted against RAN’s user requirements by the DoD (Department of Defence). A comprehensive business case was jointly developed by aadi Defence, AMOG, and ACSA. The business case was supported by engineering calculations based on well educated guesses on current metacentric heights and potential affected missions that the RAN may wish to conduct. The business case was presented to key stakeholders within RAN and DSTG over the course of several months and multiple meetings. DSTG-MD performed their own analysis of the technical approach and produced a detailed report for RAN quantifying the level of weight savings the proposed approach could achieve, and how the work can be implemented. DSTG-MD agreed that significant weight savings and recovery of the metacentric height could be made. Sensor key stakeholders, having received the independent advice from DSTG, have indicated their support of the proposed program. aadi Defence is currently working with the DoD on the necessary steps to secure funding for this program.